The High Museum of Art has a world of wondrous art collections inside...and there's art outside as well. One of the exterior pieces includes an "untitled" sculpture that resembles a running stick man. 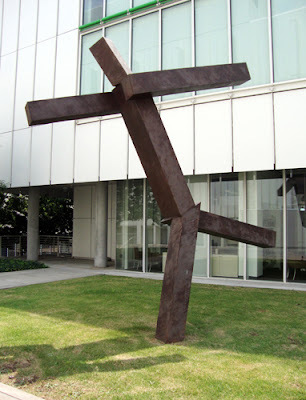 Created by Joel Shapiro, an American sculptor born in 1941, the sculpture's absence of a name, other than "untitled," is not uncommon among Shapiro's works. Walking by this 1988 bronze sculpture on numerous occasions, it's one that tourists enjoy mimicking in pose for photographs...rather fun, I think.